Milazzo Industries, Inc., your complete source for a full line of snow and ice control products, now offers a product that is safe for pets. 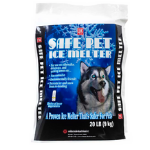 Qik Joe Safe Pet Ice Melt does not contain the salt of any kind. It is environmentally safe, non-corrosive, and contains no chlorides. Unlike so many other ice melting agents, Qik Joe Safe Pet will not burn or cause irritation to your pet. When used as directed, Qik Joe Safe Pet should not harm good quality air-entrained concrete, grass, shrubs or carpet.